Frankly, one would rather wait for the film. 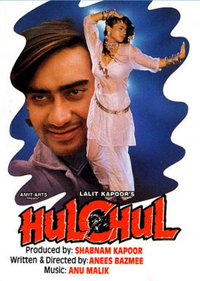 Hulchul, as a film, is worse than that glue-bowl: equally extraneous and redundant, but much more irritating. It's important to deliver what you promise. Years ago the late O.P. Ralhan made a film called "Hulchal" which was about a mistaken murder conspiracy. The pace was maddening. Years ago, the late O.P. Ralhan made a film called Hulchal"
"HULCHUL" IS PRIYADARSHAN´S LATEST COMEDY AFTER HITTING THE BULL´S EYE LAST YEAR WITH "HUNGAMA". The movie aims at being comical while having drama at its core.